If there’s one thing I can’t stress on this blog enough, it’s how fortunate I feel to have made some connections with ex-ballplayers in the past two years. Not everyone wants to talk, and some say the number of teams and games combined with the passage of time make their memories not so reliable. I completely respect their right to privacy. Others have been very giving with their time and memories – and sometimes toss in some memorabilia to boot! 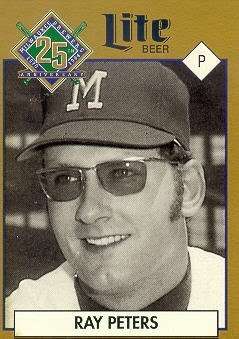 In 1970, the first year of Milwaukee Brewers baseball, there were two cup of coffee player appearances. Both are notable because they came prior to the September call-ups. Pitcher Ray Peters made just two starts and saw his major league career last about a week. You’re probably curious about the other short-timer because I brought it up. His name was Bruce Brubaker, also a pitcher. Bru made one appearance for the Crew before being sent back down. He only appeared in one other big league game in 1967. After Ray graduated from Harvard, the big righty reported to the expansion Seattle Pilots minor leagues. Of course the Pilots only lasted one season before moving to Milwaukee in 1970. Ray didn’t make the Brewers roster out of spring training and was sent to the AAA affiliate in Portland. It was not a great park for pitchers according to a number of the other players I’ve conversed with. Ray was called up on June 1, and made his debut against the Indians on June 4 in an 8-4 loss at Milwaukee County Stadium. On June 9, Peters made his second and final start and got to face Al Kaline and the Detroit Tigers. In two games his final line was two innings with seven hits and five walks – equaling a 31.50 ERA with a 0-2 record. And that’s the short version of Ray’s career. My original blog post came to Ray’s attention and he did have a couple corrections for me to make. He got ahold of me through Tony of the Off Hiatus site (big thanks to Tony for connecting us). I’ve exchanged emails with Ray, and shared some great info beyond what I originally posted. Ray also took my home address and was nice enough to send out a letter he sends to autograph seekers and a set of baseball cards. I haven’t had an opportunity to scan these yet. But if you want to see some great cards of Ray and where to write him, check out this post over on Off Hiatus. When Ray last emailed me, he was about to head out to his wife’s 50th class reunion in Mesa. He said that while they were there, Steve McCartney (an original Pilot draftee and dear friend) was getting some guys together they hadn’t seen in 40 years – old Pilots / Brewers players. I told Ray that boy I’d like to be a fly on the wall for that get-together! “How many players on the roster of the very first day of the inaugural Seattle Pilots major league spring training (Feb 1969) were on the very first day of the inaugural Milwaukee Brewers spring training roster (Feb 1971)? and 4 pitchers: MARTY PATTIN, JOHN MORRIS, SKIP LOCKWOOD and RAY PETERS. In my book I tried to illustrate the countless moves that general managers Marvin Milkes and Frank “Trader” Lane made between early 1969 and the end of 1971. I’m not sure how much of that information will end up in the published version, but I think it’s an important piece of the early franchise years. I told Ray that it was hard enough for me to wrap my head around all those transactions, so I could only imagine what it was like to be a player in the thick of things. The constant reshuffling of the deck (roster) unfortunately left talented guys like Ray Peters and Bruce Brubaker back in the minors. They had but one shot to stick with the big league Brewers. Thank you Ray, for sharing your memories and trivia!